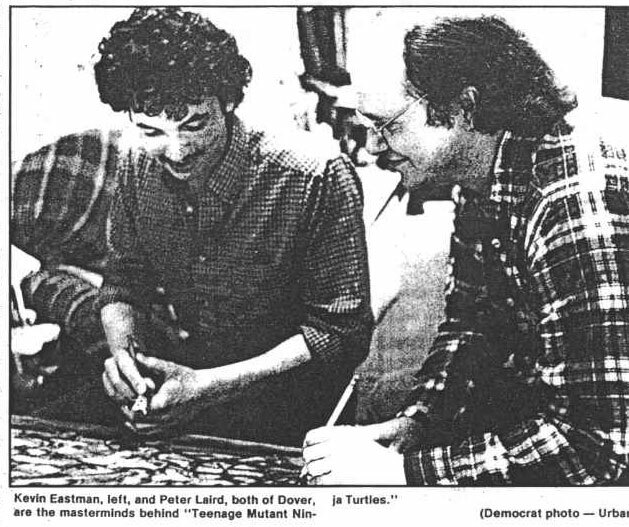 May 4, 1984 Kevin E.
If a comic book titled “Teenage Mutant Ninja Turtles” sounds a little bizarre to you, that is just fine with Kevin Eastman and Peter Laird of Dover, the two artists behind the new venture. “We lean toward the fantastic,” Laird said during an interview recently at the Union Street apartment where the pair’s Mirage Studio’s is located. 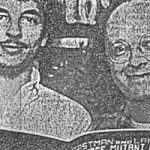 Inspired by the excitement of the convention and other entrepreneurs there, the two have worked night and day so they could introduce their 40-page comic book at the next Portsmouth Mini-Con, being held Saturday at the Howard Johnson’s Motor Lodge. “There were a lot of 4 o’clock nights,” said Eastman, who worked days at Horsefeathers restaurant and spent his nights on the comic. But at 21, he hasn’t seemed to suffer any negative physical effects from the long hours. 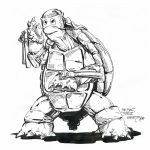 The idea for the comic book came to him one night when he sketched out a turtle wielding nunchakus, a deadly weapon consisting of two wooden sticks connected by a metal chain. 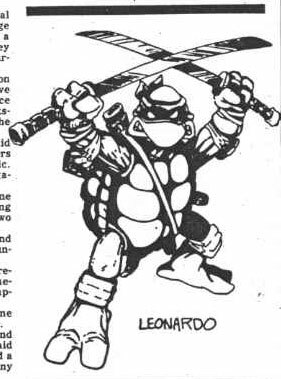 “I was just kind of doodling around, and didn’t even know why I drew a turtle with nunchakus,” he recalled. 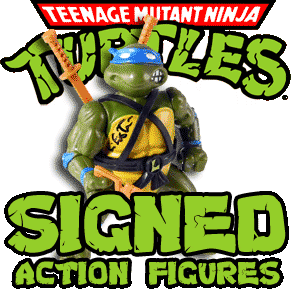 Laird is the one who came up with the name for the turtles as a takeoff on popular comics. 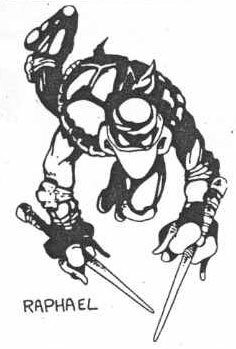 “There are a lot of teen-age mutants, and ninjas (a type of martial arts) are hot,” said Laird, who at 30 has thinning blonde hair and a boyish grin. “It essentially came out of a funny idea, and we decided to do a book about it. Plans are now under way for an animated movie based on the comic, and there are “Swords of Cerebus” toys for sale all over the country. “He (Sim) started out about five years ago essentially like us — doing it out of his house,” said Laird. 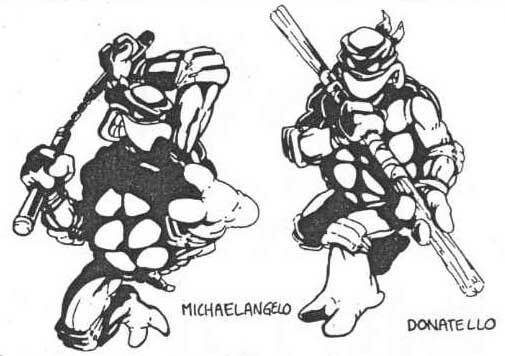 For the protagonists of their comic adventure tale, the artists settled on four turtle characters that resemble Pogos gone awry: Leonardo, armed with katanas, or Japanese swords; Donatello with bo, a long wooden stick; Michaelangelo with nunchakus; and Raphael with sais, a multi-pronged dagger. 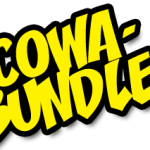 Along with the long hours spent working on the comic book, the two spent $1,100 to produce it and have 3,000 copies made, which they plan to sell at the convention and by mail order. “It was touch and go for a while,” Eastman said about the financing, but a generous loan from his uncle, Quentin Eastman of Portland, Maine, made it possible. The illustration boards alone cost $7.20 a sheet and had to be specially ordered from an art store in New York City. The special paper allows for two-tone shading. Even if the comic book does not meet with a great deal of success, the expense and long hours have been worth it, the two agree. The two spent equal amounts of time on the book, both sketching and inking the drawings. Where one would leave off on a drawing, the other would pick up. 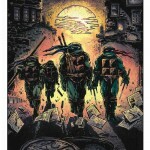 “It was neat working on a drawing and getting it started and then coming home to find it half finished,” Eastman said. “It was like having elves,” Laird said whimsically. “A page I started would be half finished when I wok up in the morning. Working together has motivated both to work harder – “not out of jealousy, but inspirations,” said Eastman. 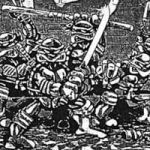 When they began “Teenage Mutant Ninja Turtles,” they first created a story and then “roughed out” illustration panels and the dialogue. They started actively drawing about six weeks ago, with the idea of completing the comic in time for Saturday’s convention. Now that it is finished, its creators hope it will be a marketable item. 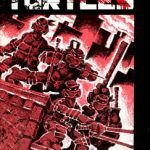 So far the response from comic book buffs and distributors has been good. The pair has even gotten an order from Alaska for a copy which they promptly pinned to their wall instead of the usual “first dollar” businesses usually enshrine. I bet I’ve gotten ideas for the next two issues while shooting around playing basketball outside” Eastman said. Both artist prepped for this career early on, collecting comic books as high school boys. Eastman is a self-taught artist, having no formal training, while Laird holds a degree in printmaking from the University of Massachusetts at Amherst. After getting directions to the science meeting, Laird walked out of the art meeting, but half way there he turned around and went back. He majored in art. If he had to do it again, Laird said, he would pick a different school because the fine arts program at the University of Massachusetts is geared toward classical works, tot the stuff comics are made of. 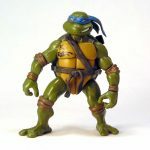 The classical training at least, gave him the names for the ninja turtles: Raphael, Michaelangelo, Leonardo and Donatello. While at the university, Laird published his first comic book, “Barbaric Fantasy,” which “was not a big seller to say the least, but it was fun,” he said. Both are optimistic that the “Teenage Mutant Ninja Turtles” will be more successful. “One thing that also helped inspire us was a change in the comic book industry within the last five years,” Laird said. “There are three to four alternative publishers challenging the majors with full-color productions. The tow are also hoping the growing direct sales market will make their book a hit. There are thousands of comic book shops that sell mostly comics, cards and posters. Normally, comic books are sold to stores, but if they don’t move they can be returned for credit. Direct sales bypasses that route; stores purchase books without the return policy. While alternative publishers are not highly visible, because they are not tied into the major distributors, they are successful. Pacific Comics is one of the biggest direct sales comic book publishers, with 10 successful titles out said Laird. These comic books are available through direct mail or in specialty shops.